Jimmy, known as Snowman, may be the last human on earth. He has survived a plague that seems to have spared no one else, save for the genetically modified human-like creations of his best friend, a brilliant but troubled scientist known as Crake. Jimmy and Crake grew up together on the Corporation compounds, the gated communities that protect the ruling class of scientists from the dirt and crime of the pleeblands that surround them. Jimmy is an average student at best, but Crake is a terrifying genius with a brilliant future in the Corps ahead of him. As an adult, Jimmy is a word-man in a world of numbers people, and so is recruited by Crake to do the advertising campaign for a new product called BlyssPluss, which is in turn sold by a mysterious woman named Oryx who seems to believe that Crake is the world’s saviour. Jimmy is troubled by Crake’s work, but he can’t leave without Oryx, who becomes entangled with both men. But all that is a memory for Snowman, who must find a way to survive in the shattered remains of the world, while also trying to guide and protect the Crakers as they leave the compound for the first time. Although the Corporations have been destroyed, the evidence of their depredation remains, their genetically modified animal creations, from Wolvogs to Pigoons, threatening to dominate the vacuum in the ecosystem left behind by the passing of humanity. 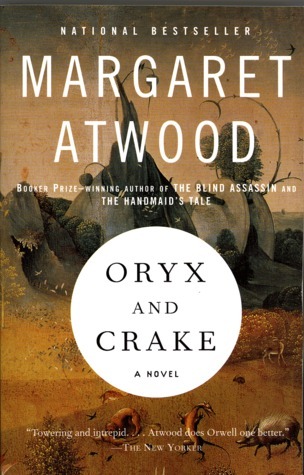 Originally published in 2003, Oryx and Crake remains a prime example of the literary dystopian novel, and a staple of Canadian literature. Margaret Atwood’s post-apocalyptic world is clearly realized through the hyper-exaggeration of modern advances in technology and science. These inventions stand out even more starkly in contrast to Snowman’s post-apocalyptic life, where he cannot even figure out how to explain toast the Children of Crake, because the world has changed so much that they have never seen bread. Although the story’s frame narrative describes Snowman’s post-apocalyptic life, this turn of events is only important when seen alongside the parallel narrative, told by Snowman through memories; it is the story of why the world ended, and how Snowman managed to survive. Jimmy’s troubled adolescence and early adulthood stand in contrast to the simple innocence of the Crakers, who are trusting and inquisitive. Yet compared to Jimmy, the Crakers are unsatisfying characters, lacking in complexity, and not particularly relatable. Jimmy, for all his flaws and shortcomings, is human, with all the history and memories that entails. The alienness of the Crakers, however, is understandable, a deliberate contrast to the humans who came before them. Crake, and Oryx, while human, are equally remote, and almost completely inscrutable. I longed to get inside Crake’s head and understand his motivation for creating BlyssPluss and the Paradice project. Oryx deliberately remains aloof, never fully opening herself up to either Jimmy or Crake, so the reader cannot know her either. The lack of insight into these crucial characters is frustrating, because we know they are not the gods Snowman has turned them into in the eyes of the Crakers. Despite the existence of the Children of Crake, this is in many ways a last man narrative, in which Snowman must confront the fact that he may well be the final unaltered human, about to be superseded by a race of beings genetically engineered for superior adaptation to the new environment. Read alone, Oryx and Crake hangs open-ended, posing more questions than it answers. Only at the very end of the story do other humans appear, leaving the world open for Atwood to continue the narrative from another perspective in Year of the Flood (2006) and Madd Addam (2013). For those craving more answers than Oryx and Crake provides, these sequels will undoubtedly be crucial to their satisfaction with the story.